The Samsung I9001 Galaxy S Plus has the stock Android gallery, rather than a custom TouchWiz version. It has good functionality, cool 3D looks and nice transition effects, but only shows a downsized version of your images. Images and videos placed in different folders appear in different sub-galleries that automatically get the name of the folder, which is very convenient - just like a file manager. The different albums appear as piles of photos, which fall in neat grids once selected. If you have online albums over at Picasa those show up as separate stacks as well. Alternatively, you can organize photos by date with the help of a button in the top right corner, which switches between grid and timeline view. In grid view, there’s a date scrubber, which can also be used to find photos taken on a certain date. If you are checking out a photo, you can use the tabs at the top of the screen to jump back to the main gallery screen, without having to go several folders back. The gallery supports finger scrolling or panning so you can skip images without having to return to the default view. Just swipe to the left or right when viewing a photo in fullscreen mode and the previous/next image will appear. Multi-touch is, of course, enabled. The Samsung Galaxy S Plus uses the TouchWiz music player. The interface consists of several tabs for the sorting options: current playlist, all tracks, playlists and albums, artists and composers. You are free to remove the unneeded ones to make the interface easier to navigate. 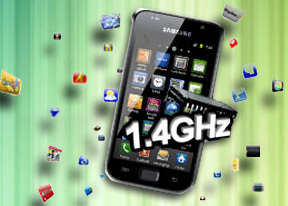 In addition, equalizer presets are enabled on the Galaxy S Plus along with Samsung’s DNSe technology. And with the added eye-candy, album view and song scrolling, things are almost as good as they can get now. You can quickly look up a song on YouTube or via Google search too. The handset prompts you to choose whether to look up the artist, the song title or the album. What’s even better, the YouTube search results are loaded straight into the YouTube client. 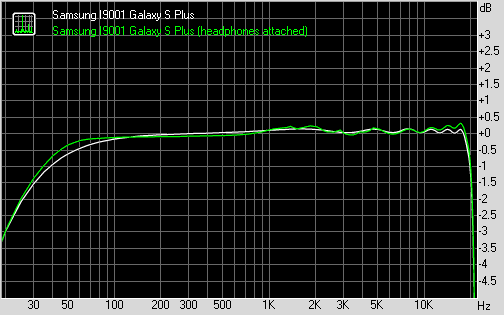 The Samsung I9001 Galaxy S Plus audio output is pretty different, depending on the way you use it. It has great performance with an active external amplifier, but it's not quite as impressive when a pair of headphones is used. So in the first part of our test, with no resistance applied to the Galaxy S Plus line-out, the scores are just great. There are really no weak points to its performance here and the only thing to frown at is its relatively low volume levels. Things weren't quite so perfect in the second part, though. The main problem is the rapid increase in stereo crosstalk, but the volume levels also turn for worse. The general result is still passable, but we've certainly seen better here. The Galaxy S Plus is slightly worse than its forefather. The Galaxy S Plus inherits the video player from the original Galaxy S. It’s easy to use and offers wide-ranging codec support. DivX and Xvid are covered and up to 720p playback too. The 1650mAh Li-Ion battery can hold for at least two movies straight. The video player app has a nice and simple interface that automatically disappears when not used to allow you to enjoy your videos fullscreen. The on-screen controls boil down to play/pause and skip buttons, as well as a draggable progress bar. The Samsung I9001 Galaxy S Plus is equipped with an FM radio with RDS too. The interface is simple – there’s a tuning dial and you can save as many as 6 stations as favorites. You can also listen on the loudspeaker, but the headset still needs to be plugged in. The FM Radio on the Galaxy S Plus differs from the one on the original Galaxy S because it outputs stereo sound, while the Galaxy S had a mono unit.